we manufacture and export analyser panels that are essentially used for analyzing the percentage of various gases. 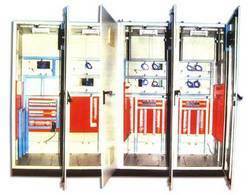 Featuring advanced instruments, mcb and other protective switchgears for supplying power, the analyser panels has systems for monitoring and controlling the instruments as per process logic. An ISO 9001-2000 certified company, N.G. ENTERPRISES, is recognized as a preeminent Manufacturer and Exporter of an extensive array of Fire Fighting Systems and Electric Control Panels. The array that we provide comprises Fire Extinguishers, Electric Control Panels, Analog Addressable Fire Alarm System and Fire Suppression Systems, offered in different models. Based in Kolkata, India, we are reaching out to the client based all over India and expanding for the clientele situated in Bangladesh, South East Asia and countries in the Middle East. We have been meeting the requirement of various type of Industries like Steel, Thermal Power stations, Cement Plant, Coal Wash outlets, Refineries, Paper Plant, etc. and through we are relatively new, our products are being used in MES and other Government departments at Port Blair (Andaman & Nicobar Island) on a contract basis. Backed by new technologies for manufacturing and delivering the products, we have managed to carve a name for ourselves in the market. Our specialty lies in proving quality certified Fire Fighting Equipment and Electric Control Panels that you can rely upon, no matter how complex the application. Quality & timely delivery are keywords of our company that are observed by our experts on a continuous basis.